One of the Moose’s favorite things in life is bread. So it really stinks that he’s got allergies to gluten and dairy. 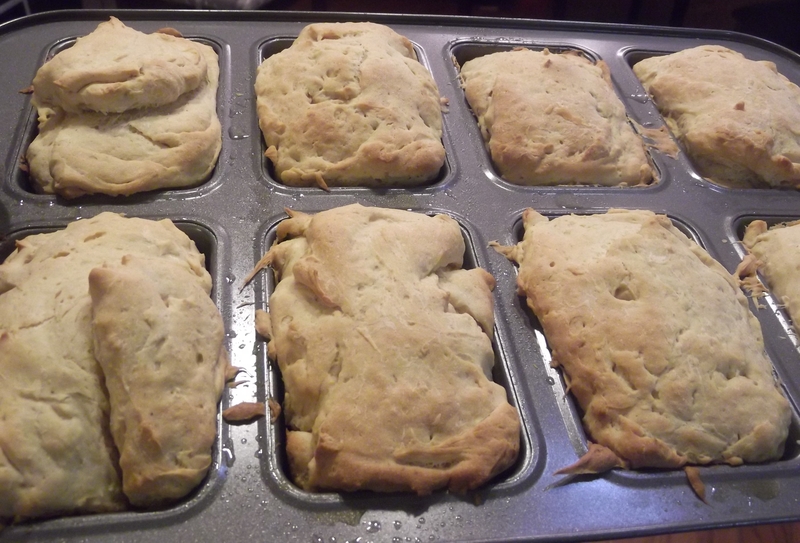 Fortunately, recipes abound for gluten and other allergen free breads, so I did some experimenting. The Moose is not particular about his breads; he likes them all. 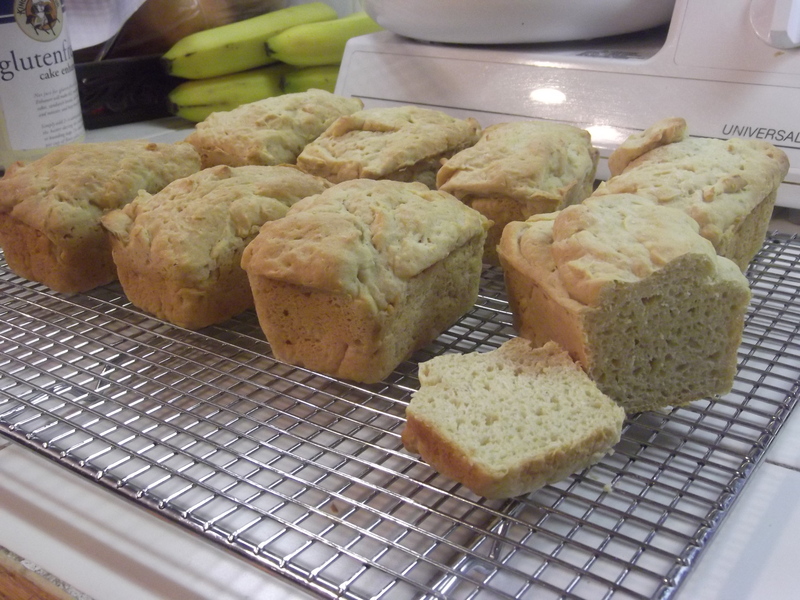 Mrs. B sent me a link to Gluten Free Millet Oatmeal Bread at Gluten-Free Mommy, so I started my tweaking from there. It’s a pretty good recipe as it stands, but you know me. I can’t leave well enough alone. In addition, at the time I started playing with it, the Moose was also having trouble with eggs. He’s since outgrown that problem, but I’m happy to report that this recipe works perfectly fine with Egg Replacer or with flax ‘eggs’. After making the recipe a few dozen times, I realized that my biggest objection to the whole exercise was having to round up a dozen or more dry ingredients every time I needed to bake. 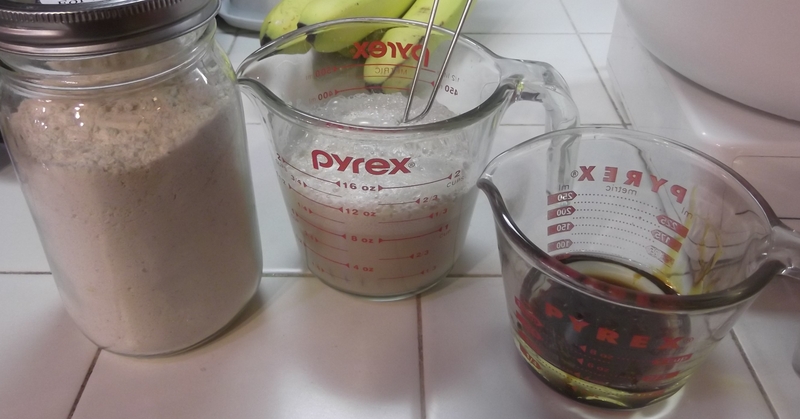 I started pre-mixing the dry ingredients and making my own ‘bread mixes’. This gave me one long afternoon offset by a half-dozen easy baking days. 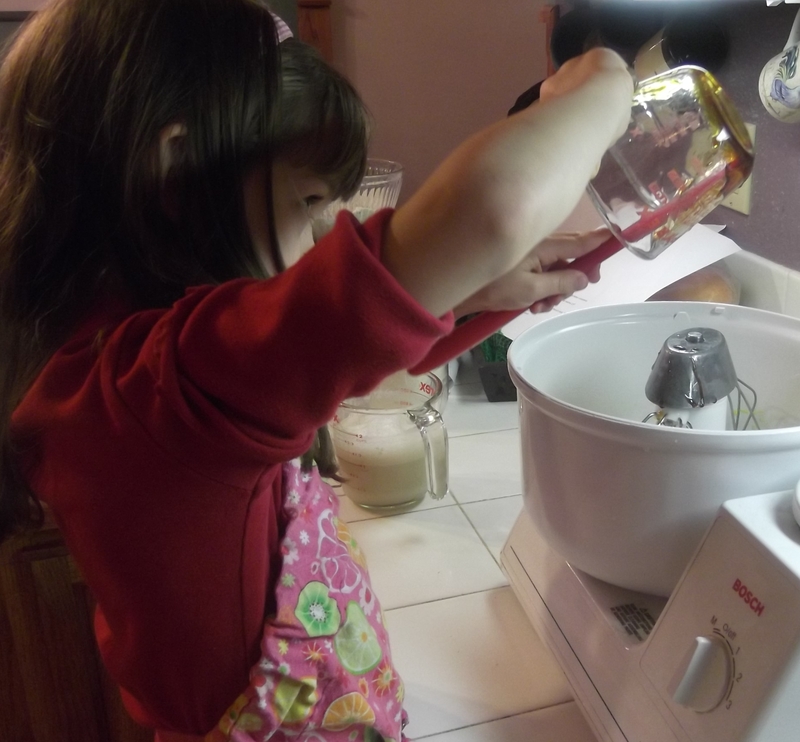 First step – beat the eggs. 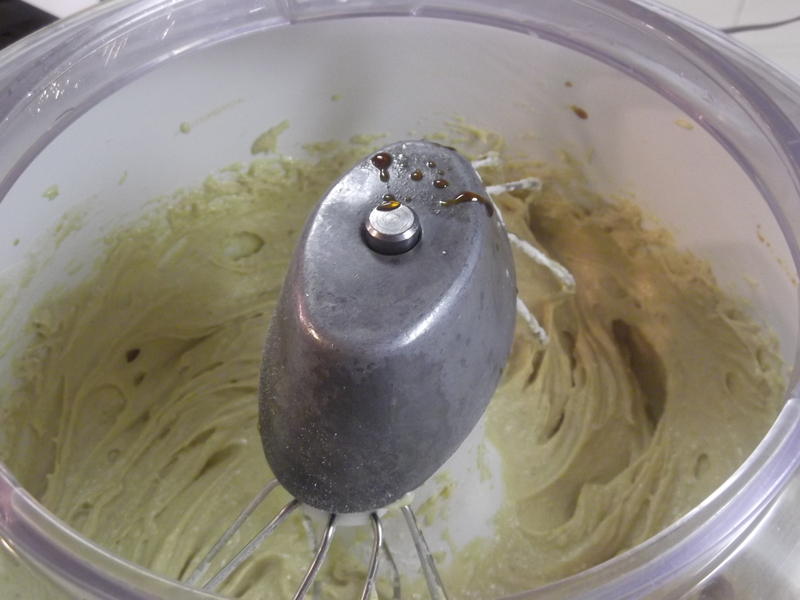 If using egg replacer or flax, make sure the ‘eggs’ are good and gooey before proceeding. 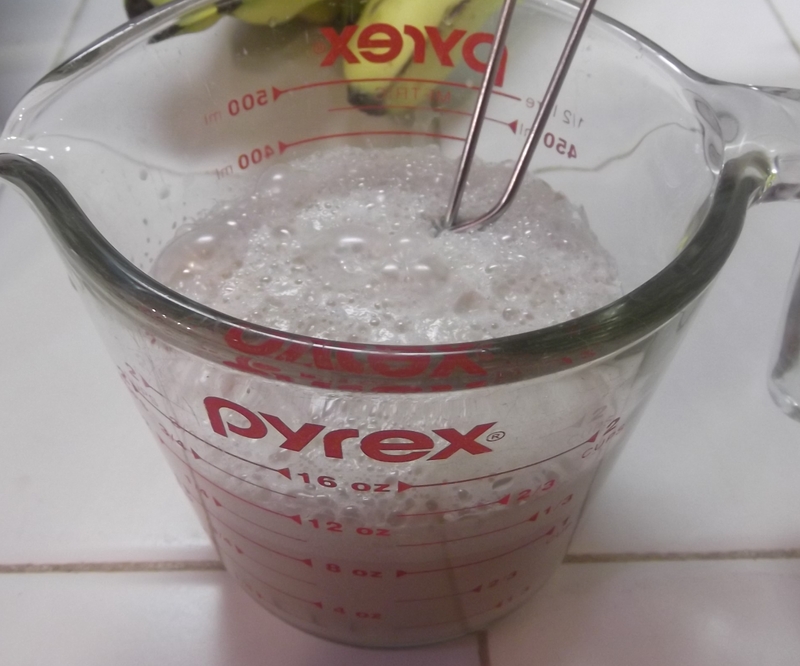 I have my dry ingredients pre-mixed here; you could also just add them to the mixer. I pre-proof my yeast and sweetener in warm water before adding it to my dough, and measure my liquids while the yeast is proofing. Happy yeast = Good bread. So easy a child can do it! Except for the measuring. Rosebud does enjoy helping out in the kitchen, and she’s very good in certain areas. Others, I reserve as Mama Prerogatives. She’s good at dumping. Her aim has improved dramatically since the first early ventures. 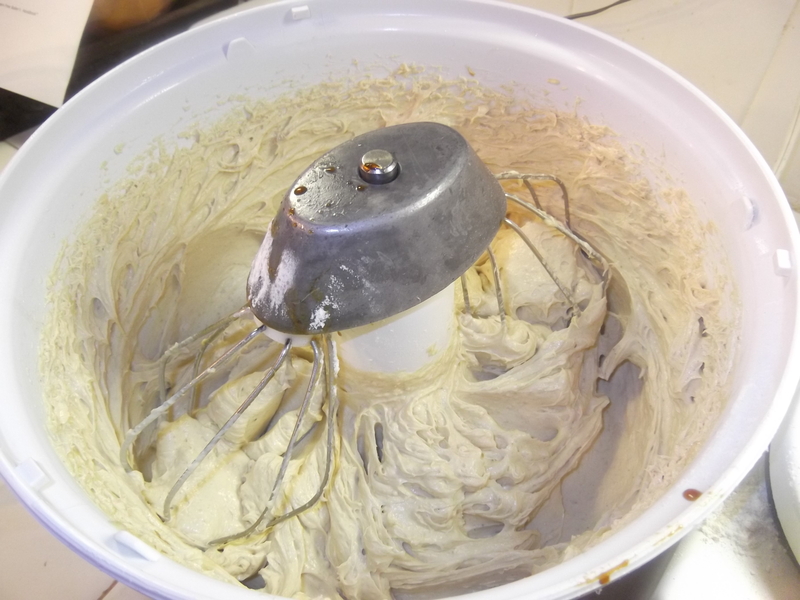 When first mixed, the ingredients are like a thick frosting. Beat in the mixer for at least 7 minutes. I believe the original recipe calls for 15 minutes on high speed. The idea here, to my understanding, is to activate the xanthan gum and to beat additional air into the batter. It isn’t for ‘kneading’, since there’s no gluten to develop. I imagine the yeast may get a bit dizzy. 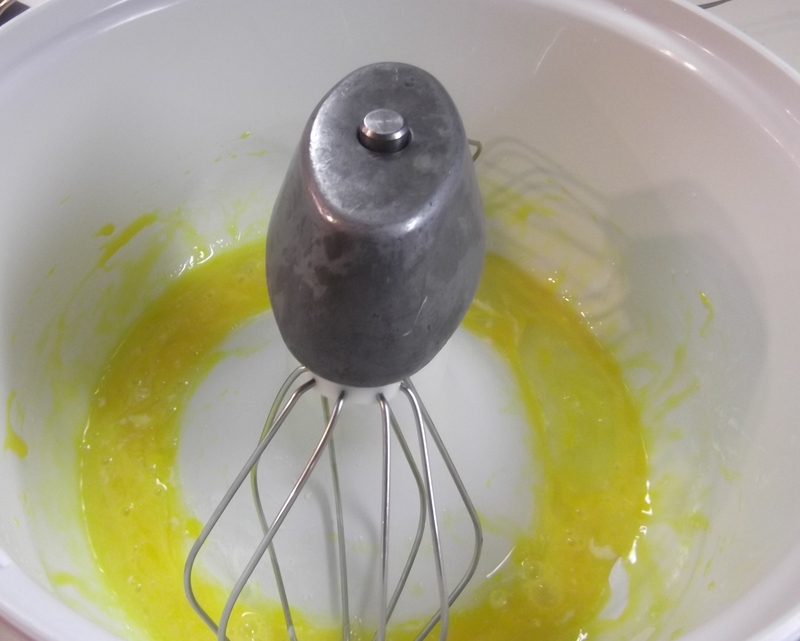 After beating, the batter should more resemble a cake batter, with lots of air incorporated into it. It’s very sticky. The texture in no way resembles a regular gluten dough, which threw me for a loop the first time I tried it out. You can’t ‘scoop’ it into a loaf pan. It’s more of a ‘dab’. 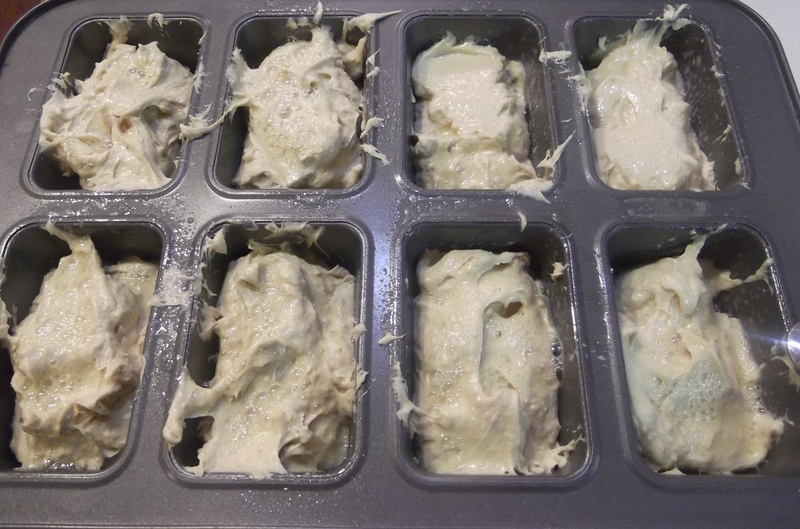 Gluten-free bread needs a lot of support to rise, so I use a mini-loaf pan or muffin pan rather than a big loaf pan. King Arthur Flour makes a ‘gluten-free bread pan’, which I may invest in one of these days. For now, the Moose does not eat sandwiches, but prefers to scarf down his bread slices in single gulps… so the smaller loaf size works real well. I sprayed the tops of the ‘loaves’ for two reasons. First was so that I could smooth them a bit with the spatula, so that the finished loaves wouldn’t be all spiky. Second was to keep them from drying out while rising. Bake at 350° for about 30 minutes (40-50 for larger loaves), until tops are brown and internal temperature reaches at least 210°. Gluten free bread requires a higher internal temperature to be ‘done’. I’ve found that if I pull it at normal bread temps (of 198°), it has a tendency to collapse and be gooey on the bottom. I use a Thermapen to check the internal temperature, but any fast probe-style thermometer will do. Gluten free bread, like most bread, is always best the day it’s made… but this bread keeps on the counter for a couple of days all right, and freezes reasonably well. I like the texture of this bread; it seems to mimic regular bread pretty well. It’s sturdy enough for light sandwiches (no Dagwoods! ), and does well in the toaster. I’ve borrowed a couple of taste-testers from a couple of other families with celiac and gluten allergies, and gotten thumbs up there as well. Beat for 7-12 minutes, until it reaches thick cake batter consistency. Spoon into loaf pans. (It only rises once.) 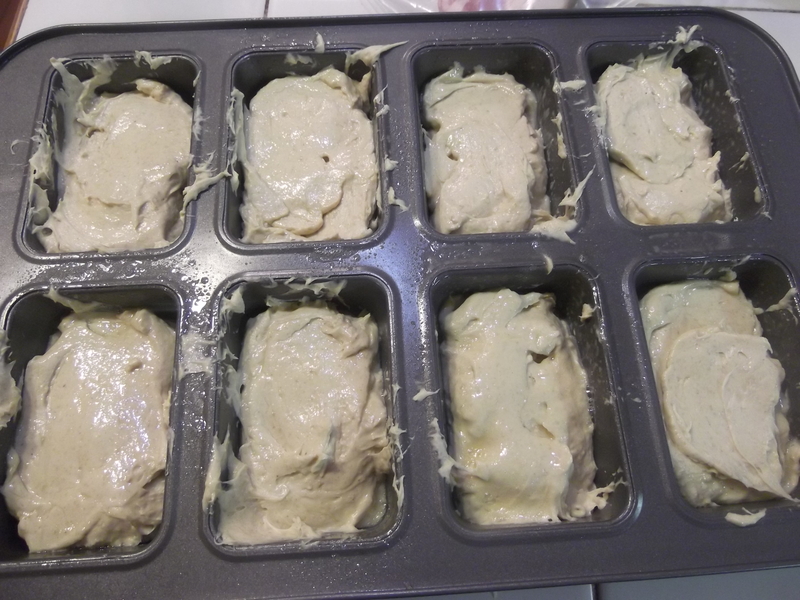 This recipe will make precisely all 8 loaves that my mini-loaf pan has spaces for, with nothing left over. Rise in proofing chamber (or on counter) for 1 hour. Bake 30 minutes (40-50 minutes for larger loaves) at 350° till internal temp reaches 210°. 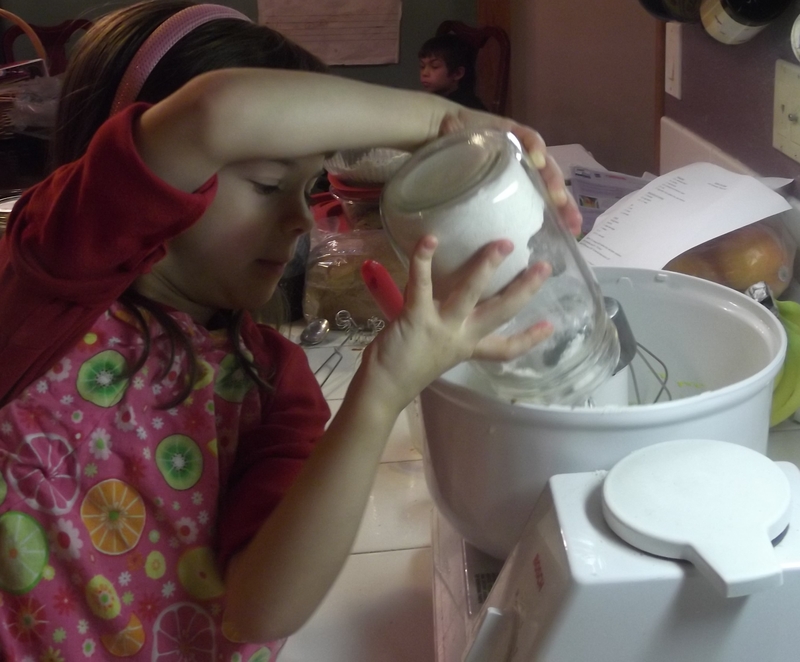 *I use “whole grain gluten free flour mix” from Azure Standard. 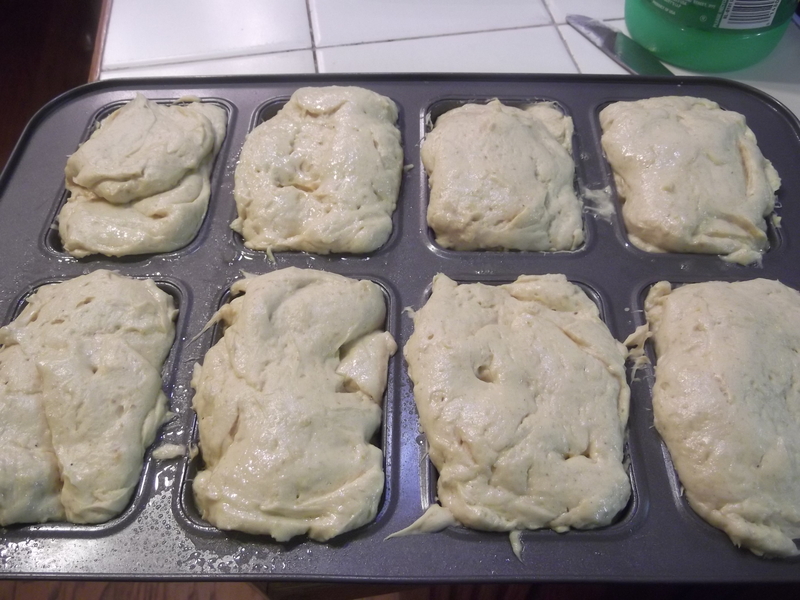 This entry was posted in Allergy-Friendly, Baking, Comfort Food and tagged Allergen Free, Allergen Friendly, baking, bread, Dairy Free, DF, GF, Gluten Free. Bookmark the permalink. Moose can have eggs, but is still dairy-free. Almond milk seems to substitute well in bread, though… I’ll have to take a look at the King Arthur GF bread recipe. I knew they had a mix, but didn’t know there was a recipe. Of course, it would make sense if there is one! Thanks so much for your reply and your suggestion, you are right I love the sound of them and need to make them asap! I have not been to SACS but it looks like Silly Yaks? The Flying Apron? I’ve never been there, but I’ve purchased one of their cookbooks. Haven’t tried any recipes from it yet – either the ingredients are things I’ve not found yet, or they’re really expensive and used in much larger quanitites than I want to experiment with, like “2 cups maple syrup” in a 6-serving dish. I generally don’t cook straight from cookbooks anyway; I see them more as a leaping-off point than anything. Drives some of my friends nuts!